The Lemorton family have been making cider and distilling Calvados since the late 1800s. Didier Lemorton represents the sixth generation making the family’s spirits, and many of their trees are more than 150 years old. They are not a monoculture producer, and along with their apple and pear production they have always raised cows. The breed they use is called the Normand beloved for the rich milk they produce. This raw ingredient is sold by the Lemortons to be used in the beloved butterfat of Normandy, going into Camembert, Pont l’Eveque, Livarot cheeses as well as for cream, yogurt, butter and caramel. The cows are allowed to graze under the trees, allowing the land to be naturally fertilized and aerated. No chemicals have ever been used on the property. Each August a traveling column still arrives at the Lemorton domaine to distill the cider from the year before. The clear spirit leaves the still at 70% alcohol and goes directly into large old oak casks ranging in size from 5,000 to 10,000 liters (13 to 27 bathtubs.) In these stained black very old barrels the distillate begins its gradual evolution of picking up color and spice while the texture begins to concentrate and melt into notes of silky preserved fruit. 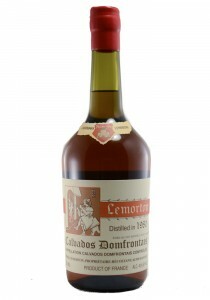 This 1980 vintage was distilled by Roger Lemorton and aged in their above-ground ageing warehouses. These above ground ‘cellars’ allow the winter cold and summer warmth to force spirit into and out of the grains of the old oak barrels and over the decades have played an important part in the spirit’s development.